“Trish” is entering her first year of basketball eligibility but this is her 2nd year of college. She spent last year at the University of Nevada at Reno. 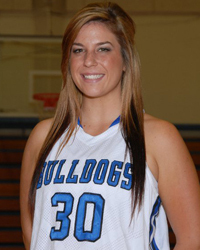 Trish brings a strong force to the Bulldogs inside game this year. She is a fierce rebounder with an outside touch as well. She played softball and basketball all 4 years in high school. She won the Senior Athlete Award. Her most memorable basketball moment was beating Santa Cruz in CCS her sophomore year. She is majoring in Nursing and her dream job is to be a military ER nurse. Her hobbies include playing poker, shopping, and tanning. She hopes to be a strong force inside this year and earn a scholarship to transfer and play. Her parents are John and Terri. She has 2 brothers, Ray (21) and Joe (18).